Thomond; Macwilliam Burke of Galway Earl of Clanrickard. 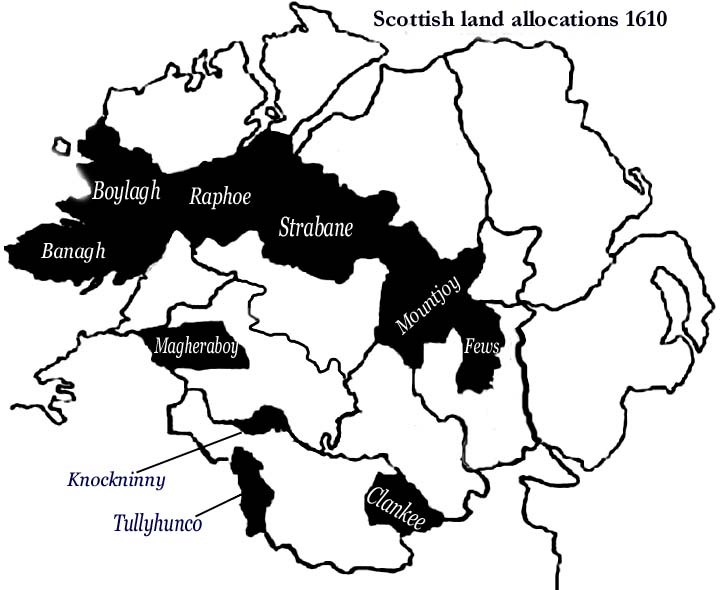 English landlords continued under Elizabeth I.
settlement began in earnest in County Down and Co. Antrim. Ballyblack, Co Down in 1607.
relatives and 60 friends and followers fled into exile. Privy Council approved Plantation of those lands. the land would be divided and allocated. houses near the bawn for security. native Irish £10.13s.4d per 1000 acres. especially the time scales, were varied in later years. restrictions did not apply to the plantations in America. consideration of emigration to the American colonies. ranking lairds with experience in handling landed estates. the ordinary undertakers were also knights of the realm. Poor Law Unions, Parishes etc. McMillan Ltd, 1984. and by St Martins Press in USA 1984.